This weekend your challenge is to take and share an image with the theme of ‘Blur’ (as suggested by one of our Twitter followers @nzphotodude). Most of us are familiar with photos that are a little fuzzy, blurry or ‘unsharp’ – yet there are times when Blur can be good and this challenge is to attempt to take some shots that use blur for good rather than evil! It’s up to you what type of blur you’re going to go for (and we’re pretty broad in our definition of blur) – whether it’s motion blur, blur from focus (or lack of it), camera shake blur…. feel free to take what ever approach you like – just have some fun with it! We’d love your shot to be a new one – don’t just share old shots, this challenge is about inspiring you to grab your camera and use it! Once you’ve taken your photos – choose your best 1-2, upload them to your favourite photo sharing site either share a link to them even better – embed them in the comments using the our new tool to do so. If you tag your photos on Flickr, Twitter or other sites with Tagging tag them as #DPSBLUR to help others find them. Linking back to this page might also help others know what you’re doing so that they can share in the fun. Was actually looking for a different thread for blur, but couldn't find it. Very little post done--just some brightness and contrast adjustments. one of my blur shot..
Taken in a parking garage, East Lansing, MI. An ice fog in Alberta in winter. Taken with my Fuji 1000sd point-and-shoot. A lot of great images here! Here is one of my contributions. HI all. Some great pictures there. Here's mine. Nikon D40 taken 30/01/10 a cold night on the hills here in Laois. Photo of a cottonwood tree beneath an intense New Mexico sunset. I am very new to this. Not sure if it is right or not. I'm still attempting to show the actual photo here and not the url link. This was taken early morning while the hot air balloon was being "blown up". Hope this embeds this time. A recent photo taken at a Johm Mayer concert. Thought it worked well with the challenge! This was taken yesterday afternoon as a test for this contest but really to try to figure out how to post pictures here and learn more about html codes which are totally and completely baffling me. This was taken early morning while the hot air balloon was being "blown up"
Australian army plane with blur on the props. Cyclist on the track, Moonah,Tasmania, Australia. Was taking some photos this afternoon when I looked up to catch this Australian army plane dropping parachutists as a display for the Hobart Regatta. Saw the blur of the props and thought that's my blur photo for the weekend. This is my third attempt at uploading my first photo to a DPS forum. I hope this works this time! Just in case it does....I have a point and shoot camera (Panasonic DMC-ZS3) and am trying to trick the auto settings on the camera to create the image I want. 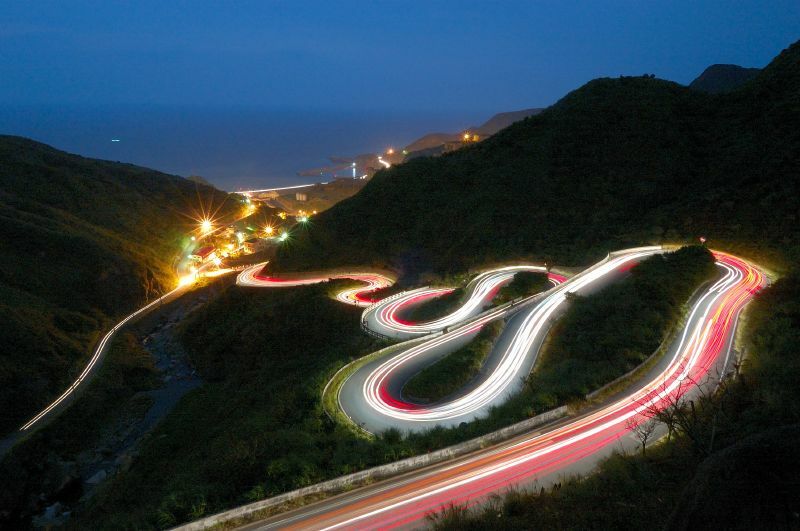 This was taken using the "intelligent night scenery" function in order to utilize a slower shutter speed. I am looking forward to purchasing my first DSLR camera, hopefully this year! Picture is not showing up. Can't figure out why? I will post that again! Mission aborted....whatever I do the image is not seen here.I wonder what would be wrong !! The flowers were a gift for my Mum. The photo a gift for a friend. Practiced the blur technique at Christmas 2009 and I liked the results. This is my first time posting in the weekly assignment. The photo is taken on a friend of mine, who is a singer/guitar player in a group called "Pure Spirit". I've named the photo "My Spirit is pure when I sing". The photo is taken with Pentax K10D & Pentax DA 18-55mm II @ ISO 160, 1/3s, f/4.5 on 35mm focal with trailing curtain flash. This is my first entry for an assignment at dps. The picture is of a friend of mine, who is a singer at a group called "Pure Spirit". I've named the picture "My spirit is pure when I sing". Hope you like it! This photo was taken for the abstract catagory for my photography class at school. i'd love some feedback - I'm new to photography! I love this panning picture I took last weekend at Houhai in Beijing. It is the season for ice skating right now and Houhai is one of the most popular places in the city to go to. Our photography club decided to have our outing there and assign themes/techniques. Our leader had some written down and each of us had to pull one out of the hat. Mine happened to be movement and I decided to experiment/practice panning shots. This particular shot I like because you can see the joy in the boy's eyes and how happy the dad is with his boy enjoying himself. this was taken during new year eve..
hand only the lens and free body then twisting. Dancing with the belly dancer... motion and energy! It is amazeing the creativeity that comes from controling blur with a camera. This crab is the size of a pin head! They are also very quick so lots of patience to get this photo. Taken in Broome WA Australia. two taken most recently, and the third at the holidays. Learning to photograph without using a flash is fun!! This was taken at North Arabians in Scottsdale, AZ during an open barn farm tour. The horse move so quickly it's hard to get a clear shot. This picture was also used in a previous assignment. Oops lets try again! Sorry! Recently taken, this picture was also used in a previous assignment. I was at the 2007 Hockey Hall of Fame Game and was enjoying the intermission entertainers. I thought you would enjoy them more if I shared some of their energy. I was visiting Julie and her Oriental Shorthairs when "Groucho" made his move. This is more of a question than a comment. I don't receive the assignments until Thursday, yet when I get it there are already postings. Why do I get it so late? Also, what are the days for the weekend challenge? This one was accidental, but I rather like the end result! Here are two....the first is the Miracle Mile in Chicago at Christmas and the second is a small waterfall in the Great Smoky Mtns National Forrest. Here is my waterfall movement picture taken a couple of weeks ago. oops... too many of my posts now... can I delete them?? Wooops, sorry about the multiposts... There should be a way to delete our own posts! Here's my submission for BLUR.... First week entering! PS Some great shots above! give up.. tried many methods but don't work... help? Why i cannot see my post here? image in the previous post didnt appear... funny.. i am using the embed code. here is it again! my embed code yesterday didnt work, so here it is...again! I went to the AMA Supercross race this weekend at AT&T Park in San Francisco, and did my best to capture motion blur by slowing down the shutter speed and tracking the riders over the jumps. Though I killed a TON of pics that came out either too blurry or just slightly out of focus, I was pretty happy with this pic, which captures a lot of the action and excitement of the race, and uses blur to really give a feeling of the speed that these guys race at. well i give up.. here is the LINK to the image.. Sorry the upper one didn't work.. Flowers fall naturally in the early morning, while I am walking along with birds singing. Sorry .. I forgot to attach the image in my earlier comment.... please find it here.... Christmas Illuminations at Shinjuku.. .
Taken at an inter-school sports competition last week. My daughter chasing the red crayon. My daughter chasing after the lost red crayon. Probably could've turned down the speed a notch or two. My wife was caring our 21 day old son so we could take some family photos in the snow. We usually do not see snow that often, and we got 4 inches on Friday. The result of shooting in the dark without a tripod. Somehow it didn't turn out too badly. Here are my links - not having much luck here today! My comment does not seem to have worked, so let me try again. The first photo I took today at the skating rink with my daughter's Nikon Coolpix. I did not want to take my Canon into the skating rink! I lowered the ISO and hoped for the best. I've got two, as suggested, I did take a few new ones today, using my daughters Nikon Coolpix. I didn't want to take my Canon to the skating rink. I lowered the ISO and hoped for some blur! The other is my all time favorite blur shot from Magic Kingdom, Disney World (Florida). I took it a couple years ago after I got back into photography, with my old Canon S2-IS. I am sorry if I have done this wrong. It is my first attempt. 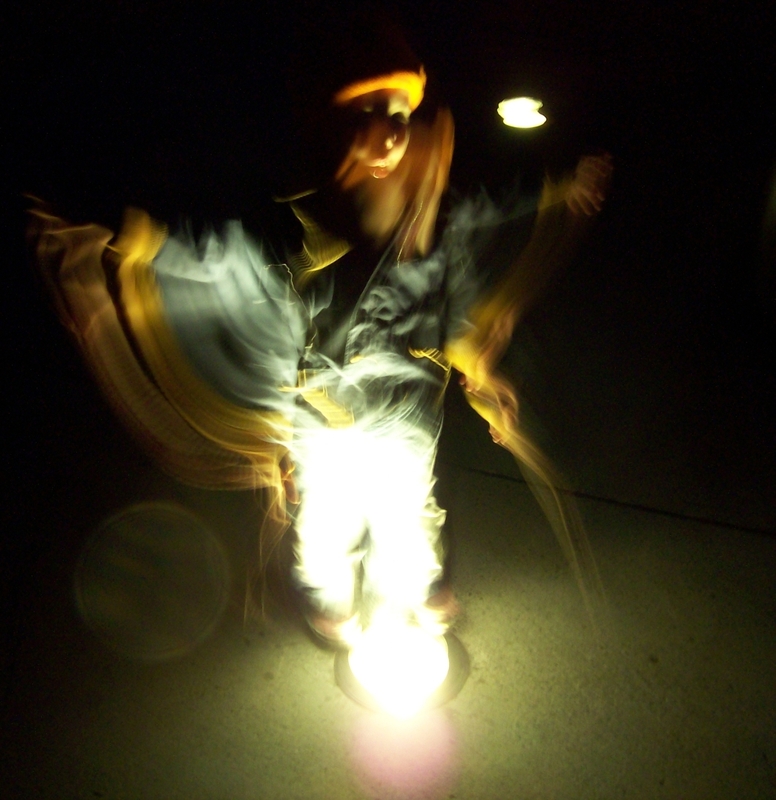 taken a while ago on a kodak point and shoot digi, my son is standing over a walkway light and moving. Taken Saturday on a winter photo walk. my 1st attempt didn't work so here's my share ( again)..
Let the learning begin. I'm a total amateur that acquired dSLR camera a few weeks ago. I know the challenge is to take a new photo, which I have and hope to upload later today, but I had to share this one. I call it, "Waiting for her baby", and I think its one of the best blur shots I've done; which may or may not be saying much. I think this is my alltime favourite out-of-focus photograph. My son peeking through the curtains.. I wasn't sure how this would work, but it seems to fit the blur. Here's a flower in my yard. The wind blew, but I've always liked this shot. I guess my embedding skills aren't quite up to par! While everyone was having fun swimming in the pool today, I thought I would try and get my DPS shot. Being a bright and sunny day in Melbourne today, it was challenging to get a slow shutter speed. A CPL filter helped bring the exposure down a couple of stops and allowed me to get this capture: Brightly coloured balls floating in the pool, being pushed around by the wind and swimmers. The blur is due entirely to movement of subjects and environment - actual focus was good. What a fun challenge! I love blur (or bokeh) in portraits. Here is as shot that I took this last friday night of an exit from the interstate near my house. Okay this I took before I saw the post but It was today and it was deliberately blurry so I don't feel at all bad about the assignment. It almost feels like I was supposed to enter this assignment. Here's my lucky shot--a heart shaped moon. I'm looking forward to the technical (uploading) challenges not being the weekend challenge. . . It's rather windy this morning in Melbourne. Leaves being blown hither and thither by strong winds seemed an ideal subject for Blur. try this again. From a concert shoot with a Aces & Eights. In addition to the "standard" band shots, I tried to get a little creative. While shooting for the Streets assignment (last weekend. . .), I was surprised by a bus as I shot some graffiti. The graffiti can be seen clearly through the blurred bus windows. One shot that seemed gone wrong turned into something like a dream. seems not to like my post... I will try back later I guess. We had the first winter storm of the year this week and I took this picture as I stood inside the door. It is my bamboo wind chime that is on our verandah. The winds were 60-70km an hour and our yard is very sheltered! This is one technique that I have embraced. Largely by accident though. When reviewing the photos I have taken I am almost always frustrated when I see a picture that has "blur"; actually, I think it is more when it is a result of avoidable camera shake; sometimes, though, the result is actually cool. One of the things that I also attempt to do is just do some rapid-fire shots from the car window (down to avoid glare) in an attempt to get something different. Here are some of my favorites. OK, I'll bite. Here's mine. Here is my entry, "Leaf blur"
Anyway, I thought I'd use this chance to say hello to everyone, since I'm new to this whole community. I hope to get to know you all and look forward to learning everything there is to know about photography! Thanks! This is of the CN Tower, Toronto, with buildings in the background. A great weekend for this challenge. We spent Friday night dancing with 7-year-olds at my daughter's school. Object captured here was blurred by blowing wind and also wide aperture (f1.8, initially to isolate the fern from annoying background). It took me sometime to realize that the combination of fern’s curly shape and color, and the blur is interesting. I love to play with blurring images. Here are a few of mine. Made some time ago, but i still want to post it . My attempt on the motion blur using my Canon A170 IS Digital camera which has limited manual functions. Here is my entry: "Leaf blur"
I know this project is meant to motivate us to go out and experiment more, instead of dig through our existing archives, so I will try to come back with at least one more later on this week! Also, sorry if this isn't what you guys were aiming at with "blurry" pics, or if I'm breaking the rules with multiple entries... I'm new to this site, and new to photography! But I definitely look forward to seeing everyone's work and learning as much as I can in the months or years to come! Thanks! I'm gonna cheat and contribute a photo that I have taken a while agon in Vienna, Austria. I can't post the image url. For some odd reason the comments do no appear...hope this works..
who doesn't love a bit of blur?? This was taken at my lil bro's wedding...my first wedding i guess..
One of my shots from a sony w55 - Spiderman (Marvel Showdown action figure). This one was pretty hard to do 'cause my Canon G9 doesn't perform smooth at high ISO, so I had to set at 1/6 speed and try to no shake. After 54 shoots finally (almost) I did it. Me costó bastante trabajo obtener esta imagen porque mi cámara no obtiene tomas finas a altas velocidades ISO y entonces me tocó poner una velocidad de 1/6 y mantener el pulso firme. Luego de 54 disparos casi lo logré. Was experimenting last summer and liked how this one turned out. Was pretty lazy to go find cars and stuff to shoot, so I panned my own arm to get motion blur.. Sorry about that, I thought I had posted it correctly and didn't. Hit the submit too soon. I took this last night while my kids were in karate class. The past week I've been experiementing with focus, blur, and exposures. Took a few pics but I clearly need a lot of practice at photography BLUR. This one was done using the zoom-in technique. It started raining (downpouring!) seconds after I took this shot - I had to put my camera away and I didn't get a chance to shoot anything else the entire morning (out on the boat!). So this was my ONLY shot of the morning! I was very bored on this day as it was a rainy weekend. All of a sudden it struck me to experiment the blur effect of th string. But it came out with a great pattern when shot with the macro lens. This is one of my favorite "blur" photographs from my "Painting with a Lens" gallery. I saw this bassist in San Diego's Balboa Park warming up behind the stage before a fundraising performance.